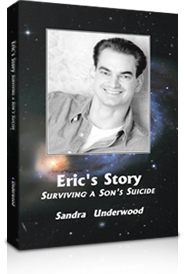 Following the tragic death of her son and only child, Sandra Underwood shares her struggle as a mother to go on living and survive the devastating loss in Eric's Story. Surviving a Son's Suicide. Sandra Underwood's sensitively written book offers insights into the devastating impact of clinical depression - not just "the blues" - on a beloved, highly talented and very accomplished son. She couples this with describing her path from overwhelming grief to finding ways to create some positive outcomes. A mother tells her story about surviving the incomprehensible loss of a beloved son to suicide. Sandra Underwood's journey -- one foot in front of the other, over and over again -- is a searing roadmap for anyone forced to face this darkness. This book also appears on survivor websites with reviews of the book and cited as a resource for others who may need help and information about the subject. Order a copy of this inspiring book now!